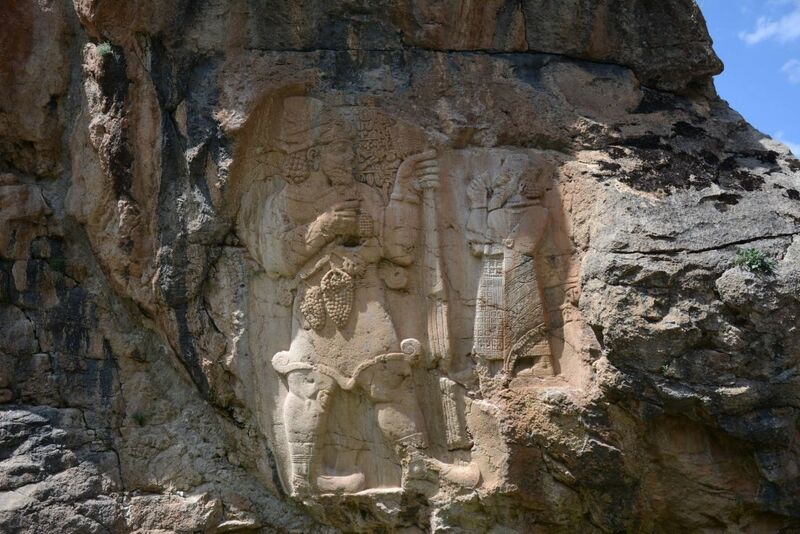 The 12 Hittite gods of the Underground, found in the Hittite capital of Hattusa, in Turkey. New study of 3,200-year-old documents from Ramses III suggests the much-reviled Philistines were not alien belligerents but native Middle Easterners. Research into ancient Egyptian records from the 12th century B.C.E. is shedding new light on a mystery archaeologists have been debating for decades: the origin of the Philistines and other marauding “Sea Peoples” that appeared in the Levant during the late Bronze Age. 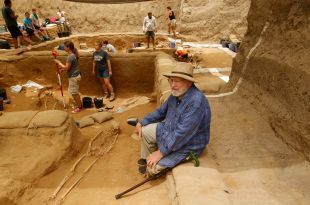 The research, and other recent discoveries, suggest the enigmatic Philistines may have been a native Middle Eastern population, rather than invading pirates from the Aegean islands, as traditional scholarship holds. 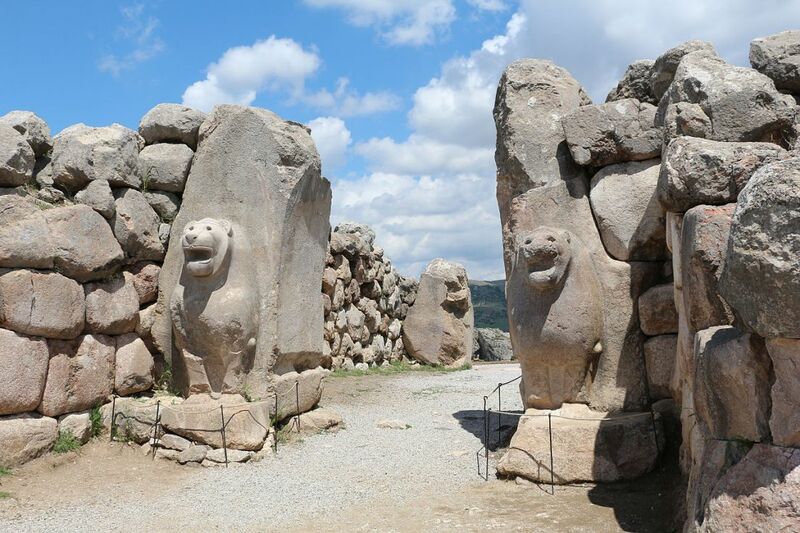 The Philistines may also have played a much less nefarious role than previously thought in the sudden and unexplained collapse of great civilizations – including the Hittite empire, Egypt and Mycenae – that occurred around the 12th century BCE. “We shouldn’t think of the Philistines and the other Sea Peoples as this huge coalition of Mediterranean fighters who whoosh through the land and destroy everything in their way,” says Shirly Ben-Dor Evian, the curator of Egyptian archaeology at the Israel Museum in Jerusalem, whose doctoral research at Tel Aviv University resulted in the article published last week in the Oxford Journal of Archaeology. The study reinterprets ancient Egyptian records from the reign of Pharaoh Ramses III, which have long been known to researchers and have formed the basis of what we know about the early history of the Sea Peoples, of which the Philistines were just one group. The so-called Harris Papyrus, a biography of Ramses III written under his son and successor Ramses IV, tells us that the pharaoh defeated the "Peleset" – as the Egyptians called the Philistines and other Sea Peoples early in his reign (around 1190 B.C.E.) and brought them back as captives to his lands. 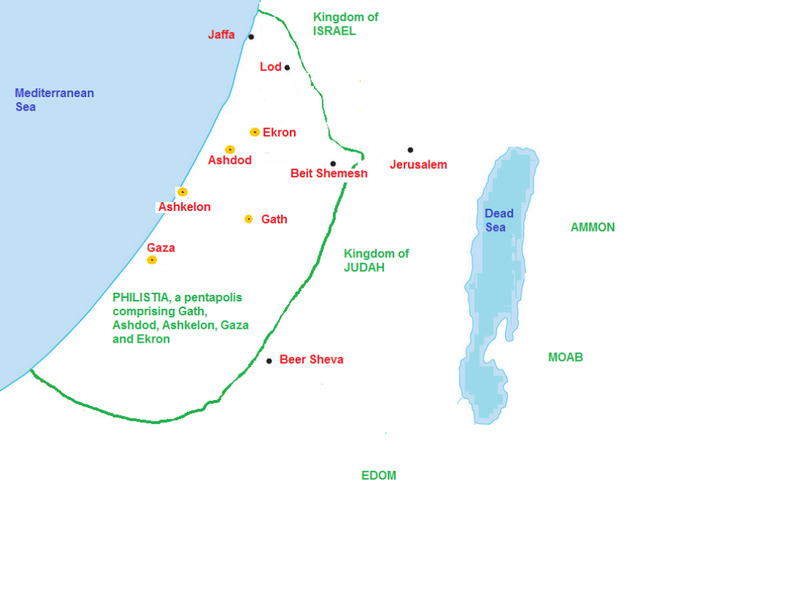 Historians have used this document to explain how the Philistines first settled on the southern coastal plain of Canaan: They were brought there as prisoners and then gained independence when Egyptian control over Canaan waned a few decades later, just in time to become the wicked archenemies of the Israelites described in the Bible. But there is a problem with that interpretation, Ben-Dor Evian notes. The papyrus literally says the defeated foes were “brought as captives to Egypt,” not Canaan, and “settled in strongholds” there. Previous generations of scholars may have been too eager to interpret Egyptian texts to fit the Biblical narrative, she says. Resettling prisoners in the heartland of the empire, rather than in peripheral areas like Canaan, was common Egyptian practice, Ben-Dor Evian says (and the Israelites would experience similar treatment at the hands of the Babylonians centuries later). There is evidence that the captives “from the Great Green” – one of the terms with which the Egyptians referred to the Sea Peoples – were probably resettled in the west of the Nile Delta region, and may have even been pressed into military service. 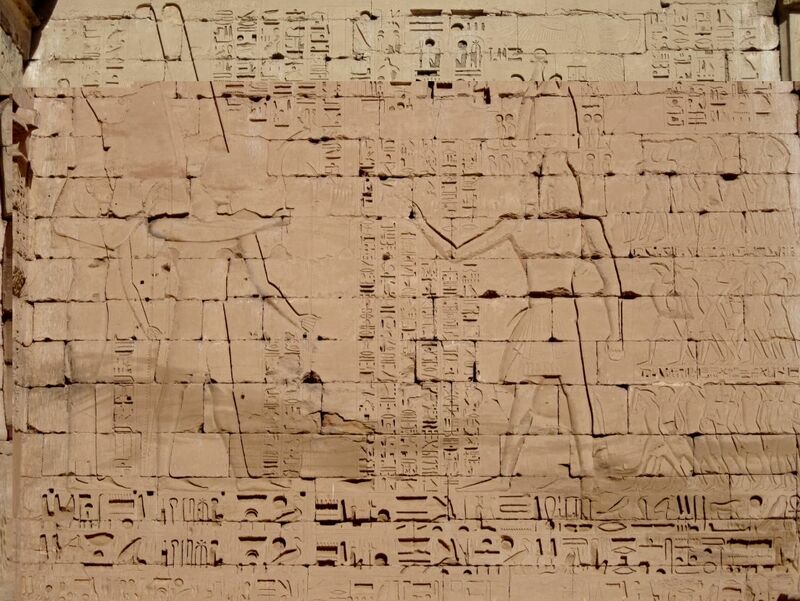 A different papyrus from Ramses’ time tells us that the pharaoh mobilized 100 Philistines and 200 Sherden (another of the Sea Peoples) to help deal with a Libyan rebellion to the west of Egypt. This would only make sense if the warriors were close at hand – rather than far off to the east in Canaan, Ben-Dor Evian argues. A vicious enemy, or embellishment by Ramses? But where did those defeated Philistines originally hail from? The answer may come from inscriptions and reliefs found at Medinet Habu, Ramses’ funerary temple, which describe the pharaoh’s campaigns against the Sea Peoples, depicting two large battles, one at land and one at sea. The reliefs do not give names for their locations, and traditional scholarship held the battles were coordinated assaults that occurred almost at the same time in northern Sinai and the mouths of the Nile. But not all agree. But the battle reliefs at Medinet Habu are not connected; they are interrupted by a scene of Ramses hunting lions, suggesting the two encounters probably happened at very different places and times. Furthermore, the land battle scene is accompanied by depictions of humped oxen and carts carrying women and children. These images, previously interpreted as further evidence of a mass migration of the Sea Peoples from foreign lands, are actually standard iconography used to identify locations in Syria and the northern Levant, Ben-Dor Evian says. Further confirming the northern context of the land battle is an inscription at the temple, describing the Sea Peoples as a scourge that had made a camp in Amurru after laying waste to Hatti (the Hittite empire), Alashiya, Carchemish and Arzawa. 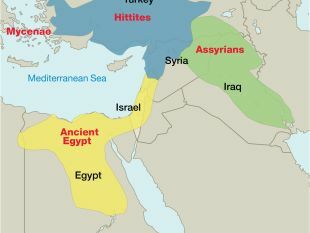 All these kingdoms – except for Alashiya, which was in Cyprus – were located between modern-day southeast Turkey and northern Syria. This list of terrifying deeds is likely historically inaccurate, Ben-Dor Evian notes: the Hittite empire had already fallen decades before Ramses’ campaign, while Carchemish is one of the few cities that was not destroyed during the Bronze Age collapse. Perhaps Ramses was trying to justify his decision to go to war, or was making his foes look more powerful than they were to aggrandize his victory. If so, his propaganda effort worked so well that thousands of years later this inscription is still the basis for viewing the Sea Peoples as an all-powerful military machine that swept, barbarian-invasion-style, through the entire Mediterranean. Ben-Dor Evian suggests that while piracy by the Sea Peoples and warfare may have contributed to weaken the great empires of the age, we need to look elsewhere for the main causes of the Bronze Age collapse, such as the increasing complexity of those civilizations and the difficulties centralized powers faced in sustaining them. 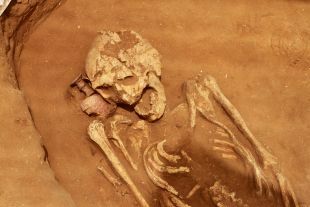 In 2013, a study by Tel Aviv University added climate fluctuation to the list of possible culprits, showing a long period of drought in the late Bronze Age that may have driven mass migration and conflict. As for the origins of the Philistines, Ben-Dor Evian says it seems likely the people Ramses III defeated may have been simply locals from Syria or Anatolia who filled the vacuum created by the fall of the Hittite empire. A Levantine origin for the Philistines is further supported, she says, by the fact that the Medinet Habu inscriptions identify the Sea Peoples as teher – the same term reserved to describe Syrian or Anatolian warriors allied with the Hittites during the battle of Kadesh, the great clash that Ramses II had won against his northern foes around 1274 B.C.E., nearly a century earlier. “So, they were not this unknown group that suddenly appeared out of nowhere,” Ben-Dor Evian concludes. Some archeological discoveries also seem to support this view. 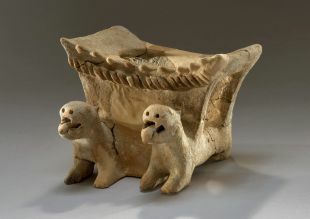 The presence at Philistine sites of Aegean-style pottery, long seen as evidence of their Greek origin, has now been shown to be a local imitation of Cypriot earthenware. Meanwhile, the discovery at Tel Tayinat, in southeastern Turkey, of several inscriptions referring to the kingdom of “Palastin” or “Palasatini” also suggests the Philistines may have started as a neo-Hittite power in the northern Levant and later migrated south as the Egyptians lost control of Canaan in the mid 12th century. That does not mean that the Aegean hypothesis has completely lost steam. Archeologists who last year uncovered the first Philistine cemetery ever found, in ancient Ashkelon, have described the burials there as typically Aegean. 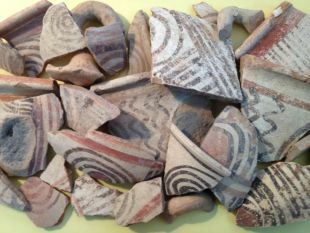 It is likely that the Philistine culture that emerged in southern Canaan was the result of various influences and migratory waves from different locations across the Mediterranean, says Aren Maeir, a professor of archaeology at Bar-Ilan University who heads the excavation at Tell es-Safi, the site of ancient Gath. “In the material culture of the early Philistines we see something from Greece, from Cyprus, from Crete, from western Anatolia,” Maeir told Haaretz in a telephone interview. The archaeologist does agree with Ben-Dor Evian that the Philistines appeared earlier than previously thought and have been unfairly characterized as particularly warlike invaders.